From a recent sale to a major Miami Art collector to a permanent installation of his art at the Brazilian Consulate in Miami, Florida, Brazilian Artist, Eric Perna’s unique artistic voice and signature style is capturing the attention of the media, art buyers and as important making his family and fellow Brazilian-countrymen proud. Painting by Brazilian Artist, Eric Perna -- "Going Back Home"
“I carried this around in my mind for so many years, and now it’s out, I have shed the emotional burden of this weight, I am purged of the mental imagery this tragedy conjured up for me that I have now transferred to canvass," say artist, Eric Perna. The artwork of rapidly rising Brazilian artist, Eric Perna, has been received by Ambassador Hélio Vitor Ramos F., Consul General of Brazil, as part of the Consulate's art collection at its offices in Miami, Florida. Perna, 38, born in Brazil and the son of a sculptor, has been painting since his mid 20s. Now, a resident of Delray Beach, Florida, and an American citizen since his youth, Perna is considered an “outsider” artist, meaning, he has no formal training. He paints on “found” objects, pieces of wood, door panels, wood frames, but he’s equally as comfortable, bold and powerful on canvass. Regardless of medium, his works and signature “tooth brush strokes” are identifiable, whether the palette in the instance may be colorful or somber. Many of his subjects, men, women, and children, people from his past, family members even, can be happy, troubled, tortured, thoughtful souls. Yet, his art, his talent and the remarkable range of his skills defies academic conventions. Without knowing the intentions of the artist, it would be difficult, if not impossible to “see what’s there,” but what’s there is a classic religious Brazilian symbol, there is another iconic “winged” symbol of good and evil “on the man’s shoulder,” there’s even an airplane that represents inner feelings and the mixed duality of freedom reflective of the spouses’ eventual death. While this very personal and tragic incident between this couple percolated in Perna’s soul and emotional psyche for nearly 7 years. The emotions he felt about it have finally simmered up to the surface and this art was the manifestation of that event so many years ago. “This was a release of a vortex of emotions that I witnessed first hand what this couple went through so many years ago,” says Perna. He continues: “I carried this around with me in my mind for so many years, and now it’s out, I have shed the emotional burden of this weight, I am purged of the mental imagery this tragedy conjured up for me that I have now transferred to canvass; now I can now move forward.” Perna received an official Certificate from the Consulate giving notice of the donation. The work is valued in the amount of $8,500; moreover, Perna’s painting now is displayed in the Consulate alongside the works of other prominent Brazilian Artists – Romero Britto, Patricia Secco, Jade Matarazzo and Carmen Gusmao. Perna’s recent showing of work in a well known Miami Art Gallery, Artopia, included 14 pieces of orginal art of varying sizes on various types of material, “found objects” and “canvass.” His first installation at Artiopia was featured during the introductory Fall Installation of this landmark gallery right n the cusup of the famous Wynwood Arts District in Miami. With his works displayed alongside those of masters, the event resulted in the sale of a significant piece to a well-known art collector. The artwork, a large piece, 65” x 42” titled Pan that sold for $5,000, a depiction of Perna’s father playing a “mandolin size/style” guitar,” is acrylic on a wood/door panel. The caricature figure of his father is compelling, bold, playfully irreverent and distinctly Perna. Perna’s work remains on display at Artopia through the end of January, 2014. Artopia is located at, 1753 NE 2nd ave., Miami, FL 33132. From social statement art to people, places and things, to his signature “faces” and equally distinct perspective and penchant for “children,” to abstracts, Perna is committed to producing all original work. No prints, lithographs, serigraphs or Giclees. Every single piece of work, from a 12” x 12” painting on a distressed faded wooden slat, to a door frame, and canvass are one-time-only original works of art contributing to the artist’s near and long term collectability, whether seeking a special piece for a home, gallery, museum or institution. 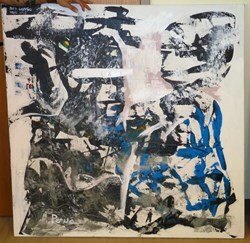 Eric Perna is represented exclusively by Jeff Mustard, Director, Florida Art Brokers (http://www.FloridaArtBrokers.com). Working with gallerists, art collectors, architects, and designers, among others, Florida Art Brokers is a company dedicated to representing a wide range of creative artists, highly talented and unique individuals from all aspects of the creative arts. From painters to musicians and other “artists” that the agency believes has a unique and highly promotable perspective, voice and signature talents worthy of commercial representation. Editors Note: A Media/Press Center at http://www.FloridaArtBrokers.com contains a wide range of high resolution images of still photos of Perna’s recent works and a sample collection of images from hundreds of earlier sold works. There are also high and low resolution videos and raw video suitable for EPK’s or other video use.